I find it fairly coincidental that i have free internet... i'm very excited about this discovery. My roommate's boyfriend has a macbook who's charger fits my computer. I have made an accord- use of his laptop charger in exchange for use of my iPhone charger. i think it's a pretty good deal. At least for a few hours. He informed me that today he found full wireless through a neighbor's apartment for the low low bargain price of $0. Tonight after work, my best friend and i went to the store to pick up the makin's for our Wednesday night ritual: Lost and Guacamole night. We also picked up the accoutrements for homemade burritos Chipotle Restaurant style (i have my very own recipe that i concocted and it is awesome, if i do say so myself). As we meandered through the aisles, we happened upon a tea section- I with my horribly sore throat from being sick decided upon some herbal tea. I have to say, the effects are definitely wünderbar. Instant. Relief. It's a naturally sweet tea. I'll admit that upon first sip, i was not very into it- but i love the aftertaste. Once it hits the rear tastebuds- it's awesome! 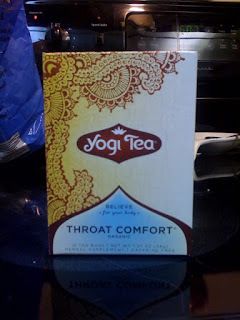 Not to mention, my throat feels awesome while i drink it. Tonight i was able to take my best friend's and my love-child home. hehe! By love-child, i mean plant... and by plant, i mean Avocado. You see, my best friend and i have a love for avocados. We eat about 3-4 a week and try to put them in things like salads, sandwiches, smoothies, and of course guacamole. I have a special recipe (involving cottage cheese- stop grimacing) that is really yummy! I decided that my Christmas gift to my best friend was going to be a growing Avocado plant. I "planted" three or four pits in different ways- but to no avail. I started them early into November and by the following month, nothing was happening. I was a bit discouraged. Well, i went to California in December to visit another friend of mine. He showed me around a little and we ended up finding these enormous orchards of avocados! it was a dream come true! I purchased the biggest avocado i could find for my best friend as a souvenir and went on my merry way. One night after i came home from vacation- out of desperation, we cut the avocado open only to find that it was not yet ripe... to our dismay, we placed both halves back in the fridge in hopes that it would ripen. three days later, we open the halves only to see that the pit had sprouted ROOTS! 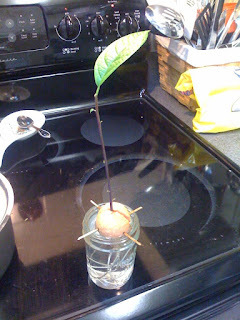 So we placed it in a jar with toothpicks- and here we have a GROWING AVOCADO TREE almost 7 weeks later! the other day, it had two additional leaves sprouting from the top. After doing some research, the suggestion we found most often was to pinch off the top leaves to encourage the other shoots to grow from the trunk. We pinched two of the three leaves off- but couldn't bear to pinch off the third. Today, (three days later) the leaf had doubled in size, and the other shoots were still smallish- so i begrudgingly pinched it off. Now it looks like a plain ole stock. LOL! My best friend and i hope to plant it in some soil within the week! We have named our love-child "Kado". I can't wait to see how nicely Kado grows as an indoor plant. Maybe someday we'll have some fruit!